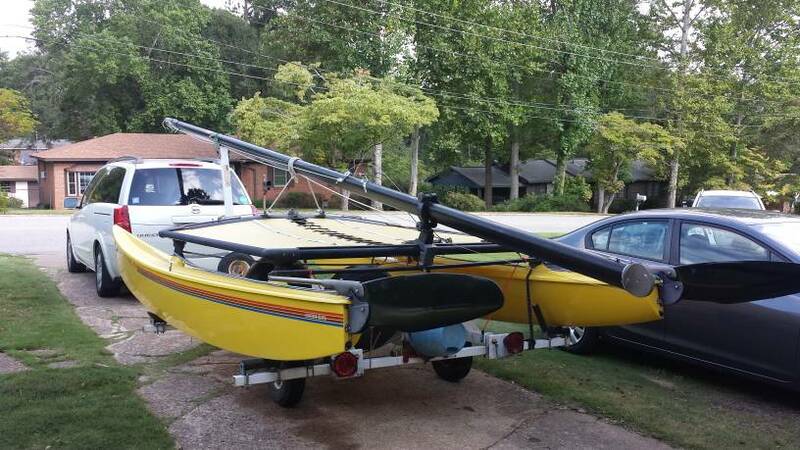 Hobie Forums • View topic - Towing a Hobie 16 or 18 behind minivan? Post subject: Towing a Hobie 16 or 18 behind minivan? I am considering buying a 16 or 18 foot Hobie Cat. But I drive a minivan. Typically when I see hobie's being towed I see them behind pickup trucks or smaller lower cars. My concern is at the mast will be hitting the back of the van. I've searched for some time and cannot find any information on this. Does anybody have any experience Towing the Hobie 16 or 18 behind a minivan what was their solution? 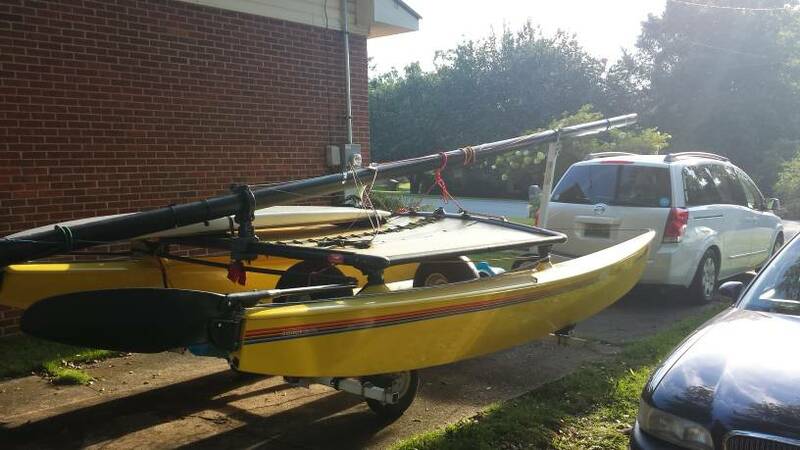 Post subject: Re: Towing a Hobie 16 or 18 behind minivan? I mount my mast on my H16 mast si it does not stick far forward enough to hit my pickup with a topper on it. It does stick out the back quite a ways though. I have a couple of bright red flags that I mount to the rear of the mast when towing. I also make sure thqt there is enough clearand between the mast and the topper so that when i go through a steep approach to a driveway that the mast does not hit the topper. You shoould not have any problems pulling with a mini van. I used to pull my H-16 with a full sized Chevy G-20 van with no problem at all. I believe you could adjust the height of the mast by moving the vertical support but I never made any changes. You can extend your mast cradle on the trailer, raise the tongue height of the trailer with a (upside-down) dropper hitch, or slide the mast back far enough that it fits. If you live in an urban area I would not recommend the last option as it will stick way out the back; especially on a H18. Whatever option you go with, keep in mind the worst case scenario, pulling into a steep driveway or ramp. This tips the mast towards your roof. I have pulled H18's and H16's with a 2002 Yukon XL without needing to modify my trailers at all. We bought a Honda Odyssey at the end of 2016 and used it several times last year to tow the Hobie. I’ve also used full size vans, RV’s, sedans, pickup trucks, and SUV’s. Just about any vehicle can be used to tow a Hobie. Mast clearance over the roof shouldn’t be an issue with the van as long as the forward mast support on the trailer is long enough to get the mast a foot or so above the roof. Also make sure the mast support is mounted far enough back on the trailer so the rear hatch won’t contact it when opening. Usually the mast support can be re-positioned by simply loosening a couple bolts and sliding it along the trailer tongue. Otherwise, a minivan is plenty capable of hauling a Hobie (ours has 3500Lb towing capacity) and any mast clearance issue can easily be corrected if needed with a minor modification to extend the height of the trailer mast support. Certainly not something that should prevent you from getting a boat. No problem. As other people have noted, the front mast support can be adjust to control the clearance. I've towed Hobies behind a couple of different minivans, and a VW pop top camper. I've seen cats towed behind camper vans too. I tow my H16 with a 2006 Nissan Quest minivan and haven't had any problems with mast clearance. The Quest also has a V6 so it easily pulls my boat. Most mast stands are adjustable to give you the height you'd need. I've been using a Chevy Astro van. As far as hitch height, you want to have the boat level for raising the mast. Not too high in the bows. One concern about towing is a cooler for your automatic transmission. If you'll be towing any distance at highway speeds you'll need a cooler. You want the trailer to be level so it tows properly. If you have mast clearance issues, that should be corrected by adjusting the mast stand, not by lowering or dropping the tongue height. Get the trailer tongue level first and then adjust mast clearance. Regarding transmission coolers, I think that necessity could be debated. One or two people in the minivan plus the weight of a Hobie and trailer are roughly the same total weight as the minivan full of people with no boat/trailer. So the fact that you're towing a boat does not automatically require a trans cooler, but if you're pushing the middle or top end of the cargo + towing capacity it would probably be worth considering. The fact that the boat is wider than the vehicle, doesn't allow it to draft behind like a small lightweight trailer. Without a cooler at 70 mph you can expect the transmission to get hot. The lockup torque converters can't take the heat, and will be the 1st sign of a problem. I towed my H16 thousands of miles with a 4 cylinder Toyota pickup with no issues. Sold truck in running condition with 286k on it. I tow behind a 1997 Saturn, and if that can handle the weight/drag of towing the Hobie, I would think a minivan would likely be fine too. Get the frame of the trailer parallel on flat ground, and use the front mast support to adjust the height. You want the mast just high enough that it clears the hatch/trunk/etc without hitting it.